Well, Its been great rocking those cute little high waisted shorts and tank tops but ladies and gents, its almost time for... Fall! For some, this is a stressful time of packing away summer wardrobes and trying to decide whats going to be wearable this fall. Well, I'm here to make it easier for you! Stay tuned for these following Fall trends you'll most likely see on the runway and on the street! This classy color combination has beens spotted on multiple runways such as Dolce & Gabanna, YSL, and Gucci. The classic leather jacket has expanded! 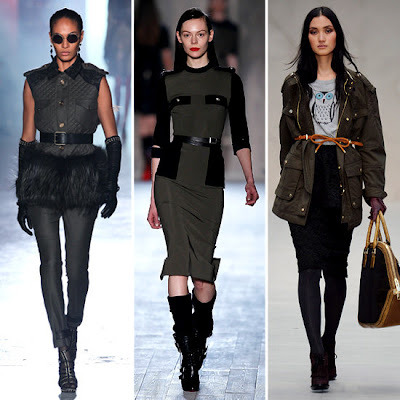 Leather is a hot new commodity to wear this season as dresses,skirts, and even shorts! We've seen this trend before but its come backs slightly reinvented. Burberry Prorsum has majorly showcased this trend. So how do YOU wear these? Its easier than you think! Stay tuned for my next blog post all about converting couture to chic!